In the words of a defence attorney working on behalf of sexually abused children, "If it takes a village to raise a child. It also takes a village to abuse one. That's the truth of it. "And that’s the idea examined by director Tom McCarthy in his new film Spotlight. It’s focused on the work of the Boston Globe's “Spotlight” special investigatory team's efforts to expose a decade's-long cover-up of child abuse by Roman Catholic priests in Boston. The film does an admirable job of telling a complex, heartbreaking, true story of abuse and institutional corruption. 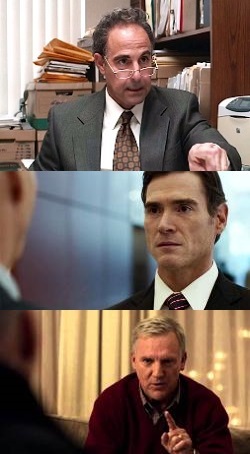 In 2001 the Boston Globe’s new editor, Martin Baron (Liev Schreiber), asked the paper's four-person team of investigative journalists headed by Walter 'Robby' Robinson (Michael Keaton) to consider investigating the case of a Roman Catholic priest, Father Geoghan. He had frequently molested children in six different parishes over a 30-year period. 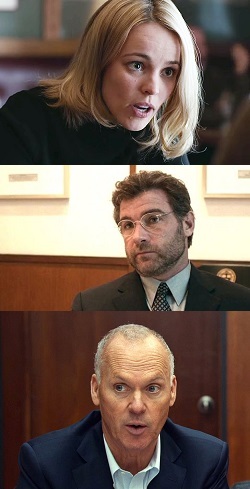 Robinson and the rest of his team, Sacha Pfeifer (Rachel McAdams), Mike Rezendes (Mark Ruffalo), and Matt Caroll (Brain d'Arcy James)—who were all raised in the Catholic church—weren't initially convinced of the alleged story’s scope but as they worked at it they dug up more information and facts. Quickly they came up against corruption and obstruction both from the Archdiocese and the legal community. After being stonewalled repeatedly by Eric Macleish (Billy Crudup), a local lawyer involved with the Archdiocese, Robinson tells him, "We’ve got two stories here, the story about a bunch of degenerate priests, and the story about a bunch of lawyers turning child abuse into a cottage industry. Which story do you want us to write, ‘cause we're writing one of them." In the end the story was bigger than Robinson had thought. Under editor Baron’s direction the team holds off publishing their findings. He wants them to go after the system itself and the systemic corruption of not just one priest, or eighty-seven priests, or any group of lawyers, or even Cardinal Law (Len Cariou). As an outsider to Boston, looking at the situation with fresh eyes, Baron —who is Jewish, making him a double outsider—believed the story was about more than one person, that it was pervasive. He was right. 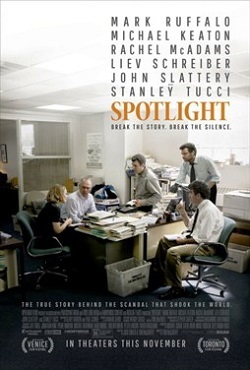 In fact, the story the Spotlight team was working on was pervasive enough that the Boston Globe itself and even Spotlight's head investigator would have to come to terms with the fact that their poor reporting in the past and their unwillingness to write certain stories contributed to the problem. In a gracious moment, as Robinson is fessing up to his part in the scandal by a sin of journalistic omission, Baron says, "Sometimes it's easy to forget that we spend most of our time stumbling around in the dark. Suddenly alight gets turned on, and there's a fair share of blame to go around.” This doesn't absolve Robinson, but it does clarify the reasons they needed to publish their findings. Earlier in the film while leaning on an attorney friend, Jim Sullivan (Jamey Sheridan), who it turns out was deeply involved in the legal end of the scandal, Sullivan pushes back at Robinson's line of questioning by blurting out, "I was doing my job!" to which Robinson replies, "Yeah, you and everyone else." Robinson's response turns out to be freighted with a sad irony. Fortunately, the film is the story of journalists finally understanding the magnitude of the story in front of them. Spotlight is well acted and its ensemble cast of well-known Hollywood actors doesn't detract. Viewers might expect a film centred on this topic to be sensationalized, but Spotlight doesn't yield to this temptation. The script from McCarthy and Josh Singer is smart and gives viewers a film that is even-tempered and generally gracious towards all parties. Overall if there's a party that comes off more guilty than another it's the Archdiocese of Boston. Thankfully, Spotlight doesn't discount the fact that there is a spiritual dimension to the story. One of the adult survivors of childhood abuse, Phil Saviano (Neal Huff), explains to the reporters that what happened to him and to others wasn't "just physical [abuse], it's spiritual abuse, "that when a priest abused a child in that way the victims are in grave danger of losing their faith. Like any viewers, Christians will find the film distressing and heartbreaking. The questions raised demand answers. And while the Roman Catholic Church is changing the way it deals with these situations as it becomes aware of them, Spotlight gets to the root cause when the ex-priest and psychotherapist Sipe on a conference call with the reporters says, "[mandatory clergy] Celibacy is the problem." Sipe continues saying that his research reveals that something like 50% of the clergy class within the Roman Catholic Church are in sexual relationships of some kind or another and that he believed that about 6% of them are involved in the sexual abuse of minors. The mandatory celibacy requirement means that lies are regularly told to cover up any sexual relations. Lutherans and protestants overwhelmingly encourage their clergy to marry citing St. Paul who says, "Because of the temptation to sexual immorality, each man should have his own wife," and "It is better to marry than to be aflame with passion" (1 Corinthians 7:2, 9b). Spotlight may afford the opportunity for viewers to ponder anew the benefits of clergy marriage. Since the 1530's Augsburg Confession Lutherans have practiced marriage for its clergy and advocated for the widespread return to this practice. While clergy marriage cannot stop every case of child sexual abuse it does promote healthy and biblically faithful sexual relationships and provides a legitimate outlet for them to take place. 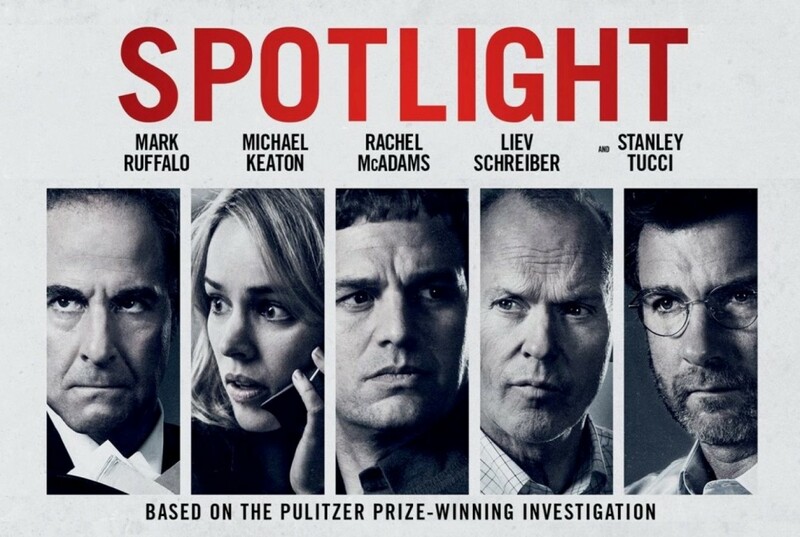 Spotlight is a tragically fascinating film about people doing the hard work of uncovering something others want to keep secret. The reporters sit at the back of court proceedings, they go to the archives, they conduct uncomfortable interviews with broken people, they check and double check their information and get corroboration of evidence, they fight legal red-tape, and they literally knock on doors hoping to talk with people who will talk when it seems the whole city of Boston wants to keep quiet. The movie is emotional without being melodramatic and will hit many viewers hard. This is made even more poignant because Spotlight isn't a flashy film; the clothing, the sets, everything is mundane and common. Neither is the audience manipulated by the soundtrack or by clever camera work. The strong story and acting are enough to keep a viewer’s attention. Tom McCarthy has taken on a difficult subject in Spotlight but in terms of getting the details and the tone right he has succeeded in telling the journalistic part of this troubling story. He skilfully provides a movie of substance worth watching even if it's painful to view. Rev. Ted Giese is associate pastor of Mount Olive Lutheran Church, Regina, Saskatchewan, Canada; a contributor to KFUO AM Radio, Higher Things Magazine, The Canadian Lutheran and Reporter; and movie reviewer for the “Issues, Etc.” radio program. Follow Pastor Giese on Twitter @RevTedGiese. Check out our Movie Review Index! The Lutheran argument for encouraging clergy marriage can be read here: Augsburg Confession Article XXIII The Marriage of Priests.